Training camp is nine days in and every Lions fan has seen the news. “Matthew Stafford looks great,” “Stafford impresses teammates and coaches alike,” “Matthew Stafford is the real deal.” However, we’ve all seen this before. In August of 2002, Lions fans succumbed to the nastiest four-letter word of them all, hope. Joey Harrington was impressive in training camp, wowing everybody with his accuracy and intelligence. Mike McMahon would only hold him off for so long and then lead the Lions into the future. Harrington had a promising rookie year, Mooch was hired and undermined Harrington in his second season and then he became a punch line in his third and fourth years. Stafford isn’t much different at this point. Harrington was a Heisman candidate, Stafford was the star quarterback on the top ranked team in the country going into his final season. Harrington had great accuracy, mechanics and was a proven winner. His detractors said he was a system quarterback, didn’t have a strong enough arm and he was over hyped. Stafford has the big arm, has been in the spotlight since high school and came from a pro-style system. His detractors question his decision-making, accuracy and maturity. Harrington was cheered heartily when he debuted in Ford Field and later that season was on the cover of Sports Illustrated as one of the promising young guns of the future, where did hope turn to hate? Last season Harrington spoke about how he wasn’t ready to start but the coaches put him in there. He started to feel more comfortable as the season went along because Morninwheg allowed Joey to take shots downfield and take risks, however that all changed when Mooch came to town. Mooch was a very conservative play caller and despised turnovers. Harrington said the pressure of avoiding turnovers handcuffed him and made him second-guess everything he did. The confidence he gained his rookie year evaporated. Stafford has a luxury that Harrington was not afforded, and that is the support of the organization. The front office and coaching staff are behind him, Harrington was a scapegoat. Stafford was drafted to fit this coaching staff’s vision; Harrington was a square peg being jammed into a round hole. Stafford seemingly has captured the support of the fans and locker room, but until there are results showing in the win column, I will keep my expectations tempered. Scapegoat? That is the term we use when some one is blamed for something that is not their fault. Sucking was Joey’s fault. I totally agree with you about what happened to Harrington. Mooch was the real incompetent. Not to mention all those receivers who dropped balls laid right into their hands to lead the league over those years. Most infuriatingly, Roy Williams at the worst time possible, would run the wrong route or drop an easy catch. Anyone who compares Harrington to Stafford is a moron! There isn’t anything that would put either one of these QBs in the same category. Obviously you don’t know anything about QBs. So maybe you should consider a new Career choice. Harrington compared to Stafford? There is no comparison. I agree that the Stafford-mania is going too far. This is foist upon us by a press corp that is too lazy to look for other stories and just keeps diving for the same nugget to feed a hungry Lions fan base. But what they are doing is whipping up the Lions fans into a frenzy about Stafford. They are setting the bar do high for the kid that he is not going to be allowed the rookie mistakes that most quarterbacks make. I for one have been cautioning about this to my friends and a bit in the comments that I make in blogs. I see absolutely no reason that this should be happening except for sheer idiocy. We all know this kid will have some problems here and there. We shouldn’t be compounding them with the big hype. 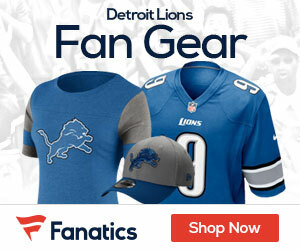 Being the #1 pick in the draft is enough pressure already, but leave it to Detroit media and Lions fans to discover news ways to make even that pressure seem minuscule compared to their own expectations.